The Leishmania parasite has a life cycle that alternates between an intracellular amastigote form found in mammalian macrophages, and a number of flagellated promastigote forms, which are confined to the gut of the Phlebotomine sandfly. transmission electron micrograph shows the Leishmania promastigotes adjacent to the microvillar surface in the midgut region of the sand fly. 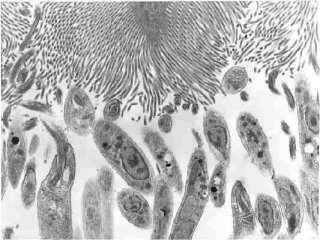 1) Transformation of amastigotes to promastigote forms and rapid growth of the parasite during blood meal digestion. 2) Migration out from the digested blood meal encased in the peritrophic matrix. 3) Binding of the parasite to the midgut epithelium and subsequent anterior migration of the parasites. 4) Transformation to the mammalian-infective form of the parasite (metacyclic promastigotes) and transfer during a subsequent feed. We are currently workng on this aspect of leishmania interactions with sand flies and have uncovered exciting research showing that the sand fly is capable of killing the Leishmania inside its gut if the immune system is activated. This work may provide clues for future new control methods aimed at disrupting Leishmania transmission by sand flies.